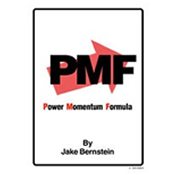 The PMF is a very specific way of selecting trades in stock and futures. The NORMAL relationship between price and Momentum is for them to exhibit parallel trends, as well relatively similar times for highs and lows. They are “in synch” or coordinated most of the time, however, when they are not (i.e. out of phase) we can derive valuable information about market strength and/or weakness as well as potential change in trend. When used in accordance with the PMF setup guidelines we can generate buy and sell triggers.